ColorMatrix CMG3000Peri Color Dosing System for Injection Molding & Extrusion . New Life Scientific, Inc. 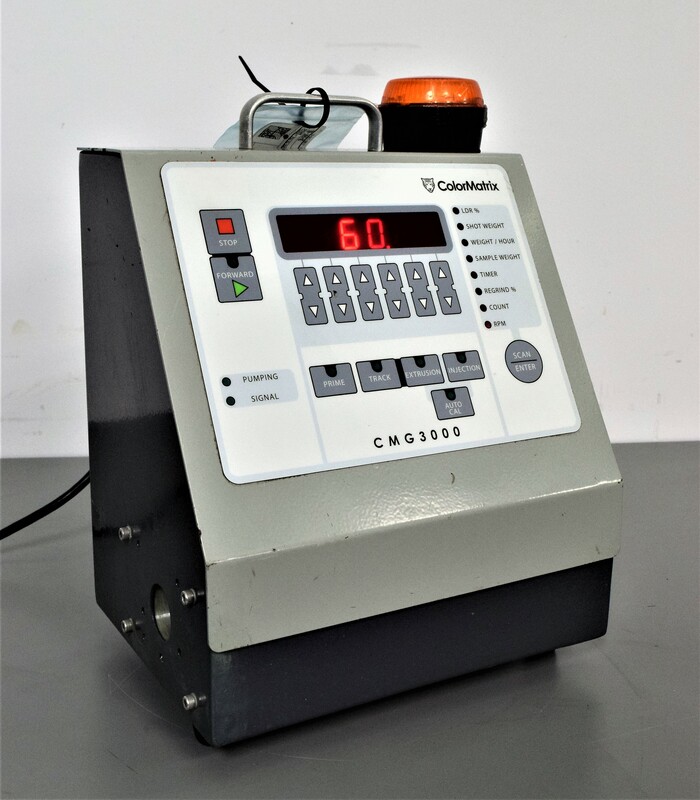 The ColorMatrix CMG3000 Color Dosing System is in good cosmetic condition with minor wear. The New Life Scientific technician’s noted that the peristaltic pump was not operating properly due to broken plastic on the pump. The ColorMatrix is designed for high level dosing accuracy and controllability for all injection molding and extrusion application. Our in-house technicians did a visual inspection on the ColorMatrix CMG3000 Color Dosing System and found it to be in good cosmetic condition with minor wear. The pump was not operating properly due to a broken plastic piece. The adapter between the motor and pump is in a zip bag. No further testing could be done. This system has been partially tested and is also supported by our 90-Day Warranty.